The Division of Cancer Epidemiology continues to provide statistical and study planning expertise to researchers in the Department of Oncology at McGill and to the various hospital oncology units in the assessment of clinical trials and other projects. Our team of staff and students are always on hand to help researchers with their epidemiologic data analysis needs, particularly the analysis of cancer patient survival, which requires substantial expertise in using specialized statistical software. Also, Cancer Epidemiology has been active in the development of mathematical models to assess the cost-effectiveness of cancer preventive strategies in Canada and internationally. To view our past and current work, see our 15-Year Report on the Division. Our unit, the Division of Cancer Epidemiology (DCE), has existed since 1988 on paper and as a de facto research and academic unit since March 1995. We have always had from one to several studies conducted at the same time by research staff. 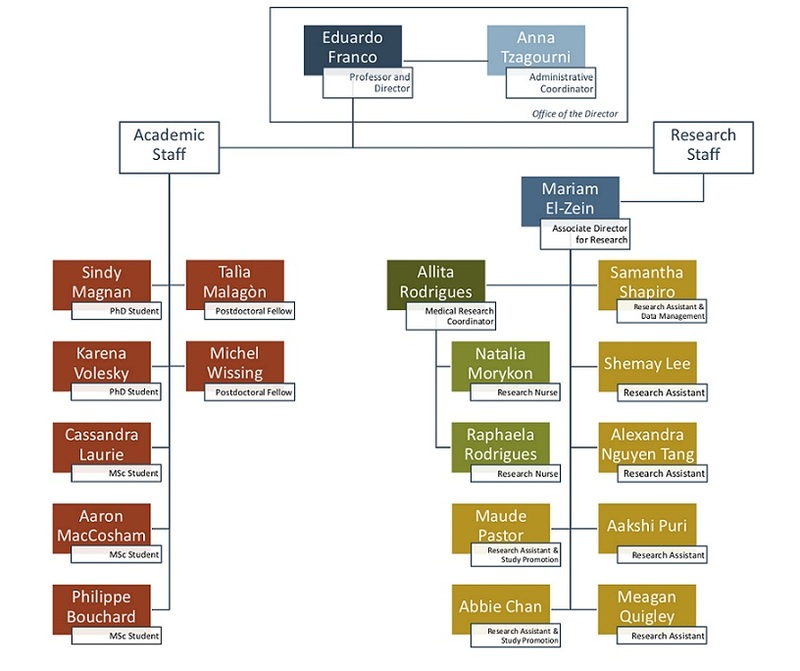 The organizational chart (below) shows the work arrangement and DCE's hierarchical structure as of November 2016. As part of a university, we have a teaching and training mission. Over the last 20 years, we have hosted and trained 80 graduate students and postdoctoral fellows. Within the academic team, there is much cross-talk with senior trainees advising the junior ones. Learning to mentor is also part of the educational process to which our trainees are exposed. We also host Visiting Professors on sabbatical from time to time, who also contribute to our mentorship mandate. Frequently in the spring, we commit to hosting undergraduate student interns for the duration of the summer, or longer. We have had over 25 of these during the past 20 years. They are assigned to specific projects, assisting the graduate trainees and fellows or helping with DCE tasks. Our Associate Director for Research, Mariam, has the responsibility of overseeing their work and, depending on the arrangement, they will also report to the graduate trainees or fellows that supervise them on academic matters. My role as director is to conceive research directions and explore opportunities in which our strengths can come to play a role in assisting the academic and service missions of the DCE. As the principal investigator of all grants that provide us with a funding lifeline I am primarily interested in making sure we have the resources and are relevant in the landscape of cancer epidemiology and prevention in Canada and internationally. We are always looking for candidates pursuing training in our Division in a student or trainee capacity. If you are interested in working with our team, please review our current work and mariam.elzien [at] mcgill.ca (email).